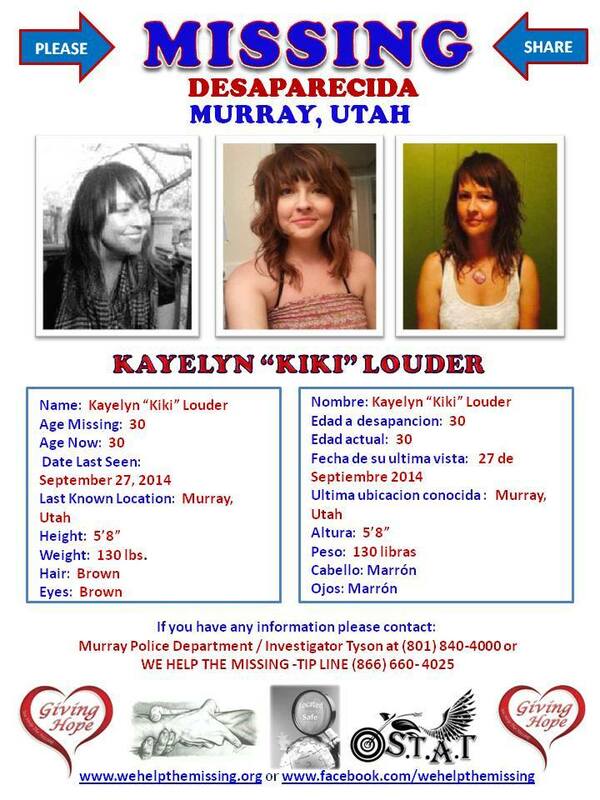 ST. GEORGE – Kayelyn Louder, 30, has been missing from her Murray home since Sept. 27 and her family and friends are asking the public’s help in assisting in their desperate search to find her. Louder left her condominium on the day she disappeared wearing only a tank top and shorts. She was not wearing any shoes and left behind her cellphone, house keys, purse, car keys and pet dog. She was captured on security video leaving the building without an umbrella in the pouring rain. Louder’s cousin, Megan Chin, told KSL that she believes someone may be holding Louder against her will. “I love her so much; I just hope she comes home. If someone has her, just let her go,” Chin said. Detectives from the Murray Police Department are leading the investigation into her disappearance. Let’s hope she wasn’t raped and murdered..
There’s more to this story. She may have had some type of breakdown.